The high level user interface contains the screens like Form, Alert, List and TextBox. It also contains Items which can be appended to the form. The advantage with the high level interface is that it is easier to program and the look and feel of the application’s user interface remains the same as that of the native code applications if they use the high level user interface. Thus the user will find it easier to operate the applications using high level interface as the elements of the high level interface will behave in the way a user is accustomed to use other applications like phonebook, scheduler etc. As the look and feel of the high level interface changes from device to device never rely on the high level interface to behave similarly on all devices. 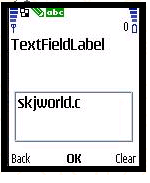 For example the Ticker will generally move from right to left on most devices but in SonyEricsson T610 it moves vertically not horizontally, a very big difference! Thus always use low level interface with the ‘SKJ UI Portability Technique’ (Explained in my earlier book ‘Mobile Phone Programming’) when you want to be cent percent sure of the behavior of your application. Low level user interface consists of the Canvas, Graphics and the Font class. Through the use of these classes we can control the user display very finely. We can draw different elements like line, rectangle, arc and text. We will discuss more about the low level user interface in the next chapter titled ‘How to work with Low Level Graphics’. All the screens like Form, Alert, List and TextBox have a common super class named Screen. 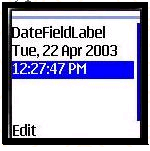 The programmer can use the different screens for displaying data and getting user inputs in a portable way. The Screen class also provides the support for setting a Ticker, which could be used for various purposes. We will now discuss all the 4 types of screens in detail. Therefore any sub class of the Item class can contained within the form. Thus a form can act as the container for gauges, images, text, lists and dates. Also being a subclass of the Screen, Ticker could also be set to a Form. All the items contained within a form can also be referred to by their indexes. The index of the first item is 0 and that of the last index is the number of items in the form reduced by one. The example code for using forms has not been given here separately as the construction of forms and appending them with items is there in the code examples for each type of Item. Apart from defining the different types of Alerts for different situations the MIDP has also given the option of showing any image inside an Alert. This image has to be provided by the developer. You can use the images in all kinds of Alerts. We shall now look at the practical code for the construction of all types of Alerts. 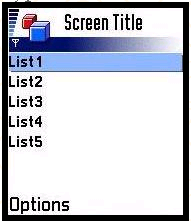 A List is a user interface element that is used to display options on the mobiles phone. 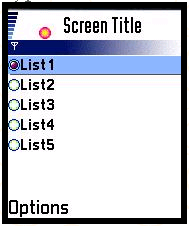 The List is the mobile phone equivalent of the desktop’s ListBox and ComboBox. 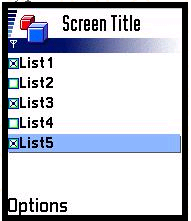 The lists can be used for displaying menu options. The IMPLICIT list offers a very convenient way for construction of menus and simple lists. It also gives the programmer an automatic command i.e. ‘public static final Command SELECT_COMMAND’. This Command enables the programmer to know whether the user has selected an element of the List. The events generated by this Command could be used of like that of any other normal command. For knowing which particular option has been selected in an IMPLICIT List use ‘public int getSelectedIndex ()’ method. In an EXCLUSIVE List the user has the option to choose one out of many elements. For knowing which particular option has been selected in an EXCLUSIVE List use ‘public int getSelectedIndex ()’ method. 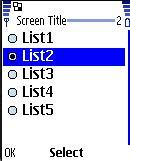 In a MULTIPLE List the user can choose many options at the same time from the List. To know the selection status of different options in a MULTIPLE List use ‘public int getSelectedFlags (boolean selectedArray_return)’ method. This method returns a boolean array containing the status of each element of the ‘multiple’ List. If the element is in the selected state then the corresponding variable in the boolean array returned by this method is in ‘true’ state otherwise it is in the false state. The TextBox is a screen which lets the users input and edit the data. This screen is the mobile equivalent to desktop’s TextBox. 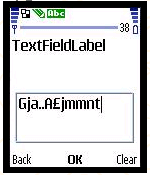 The constructor for the TextBox takes the value for the capacity, which is the maximum number of characters that can be stored in the TextBox at any time. Also the phone may pose a maximum capacity i.e. the capacity which can be the maximum for this TextBox. A good application should normally take this in to account. The getMaxSize () method could be used to have the value of the maximum permissible capacity allowed by the mobile phone implementation environment. The implementation environment of the device restricts a user’s input based on these constraints. These input constraints are very useful in certain situations like when a user wants to enter the phone number. In this case if the TextBox’s input constraint is ‘NUMERIC’ then when the user will type on the key pad the input will automatically be the number printed on that key. The alphabets printed on the key will not form part of the input. Thus the user is saved from the hassle of repeatedly clicking on the same key to input a number. Thus the input constraints should be used based on the task for which the TextBox is being initialized. 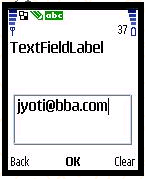 The TextBox is visually very similar to TextField. The only difference is that it has the features of a Screen and not the Item class. Items normally have a label. This label value should normally be given but it is not compulsory to give it and a null value in place of a label is legal and it specifies the absence of a label. Also in some phone in case of some items when the user selects an item to edit its contents, the system switches to a system generated screen. 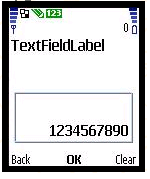 For example on most phones when you edit text in a TextField, it changes in its look and feel to a TextBox. 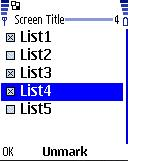 On choosing the automatically generated OK command after editing the TextField, it again becomes the normal TextField with all the contents that were added to it during the editing of text. Although normally you can append a large number of items in one Form try to avoid such scenarios. From practical experience I will suggest you to keep the maximum number of items in a Form to 3. This type of ChoiceGroup allows the user to select only one option from a given set of options. For knowing which particular option has been selected in an EXCLUSIVE ChoiceGroup use ‘public int getSelectedIndex ()’ method. This type of ChoiceGroup allows the user to select any number of options from a given set of options. To know the selection status of different options in a MULTIPLE ChoiceGroup use ‘public int getSelectedFlags (boolean  selectedArray_return)’ method. This method returns a boolean array containing the status of each element of the ‘multiple’ ChoiceGroup. If the element is in the selected state then the corresponding variable in the boolean array returned by this method is in ‘true’ state otherwise it is in the false state. 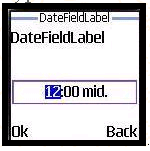 DateField in different devices look and also sometimes behave differently. 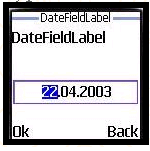 Thus care should be taken to deliberate on the look and feel of the DateField on the actual devices on which the application has to be deployed before using them in an application. The look and feel of the gauge is dependent on the handset. This fact should be kept in mind. The ‘public void setValue (int value)’ method is used to update the values of the Gauge programmatically. In case of an interactive gauge the users are able to modify the values by there actions. The end user can use the Left key and Right key to edit the Gauge. 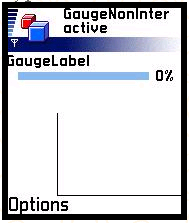 In case of a non – interactive gauge the users can not modify the values. The modification of values is possible only through the use of ‘public void setValue (int value)’ method. The minimum value for a Gauge is 0. If you will set the initial value of the Gauge to more than the maximum permissible value then it will automatically set the maximum value to 99. Providing LAYOUT_DEFAULT causes the system to use the system’s default layout policy. Also these are just the indications to the device. The device may not follow these due to resource constraints. Also remember that only immutable images should be added to it, otherwise it will throw an IllegalArgumentException. Both the label and the text should be strings. This subclass of Item is used to give a string output to the user and it does not support the input of strings from the users. Although the application can by itself change the contents of the StringItem. The presentation of the label and the text may differ in different devices. Some devices display the label as bold, while others don’t. For a better understanding of user interface presentation in different devices, you may subscribe to ‘SKJ KnowledgeNET ’ by writing to knowledgenet@skjworld.com . 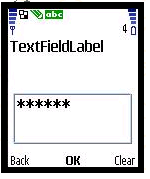 The constructor for the TextField takes the value for the capacity, which is the maximum number of characters that can be stored in the TextField at any time. Also the implementation may pose a maximum capacity i.e. the capacity which can be the maximum for this TextField. A good application should normally take this in to account. The getMaxSize() method could be used to have the value of the maximum permissible capacity allowed by the implementation environment. 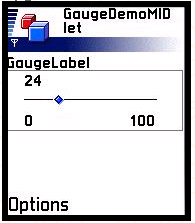 The label string is shown to the user to represent a command. In commands having command types other than SCREEN, the label value may be overridden by a system specific label which is more appropriate for the command on the device. The type of command refers to the intended use of the command. This is practically used by the device to present the commands at the appropriate place according to the user interface of the device. The placement of the command on the left soft key or the right soft key depends upon the type of the command. Priority value is used to describe the importance of a command relative to other commands on the same screen. A lower number indicates a greater importance. If two commands will have the same priority and type then there order depends upon the order in which they are coded. This code shows an example of implementing the action for back command in form1. Whenever the user will press the back command in form1 this code will set the current display to list. The Ticker class implements a user interface element that contains a piece of text which runs continuously across the display. It is like the ‘marquee’ element of Hyper Text Mark-up Language (HTML). Most of the devices implement it as a continuously running stream of text. But there are some devices which have other impressive implementations of this class. · Direction is determined by the implementation. This is normally left to right or vice a versa. But some devices have it scroll from bottom to top or vice versa. · Speed of scrolling is determined by the implementation. · There is no way for the programmer to start or stop the ticker as desired. · The ticker is normally always scrolling continuously except in some cases for saving the power when a device is inactive for some time. · The same ticker may be shared by several Screen objects. The tickers could be used to communicate important information to users, for example it could be used to have it represent a stock market ticker. The look and feel of the Ticker changes from device to device. 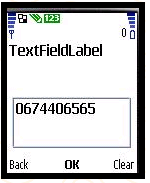 For example the Ticker will generally move from right to left on most devices but in SonyEricsson T610 it moves vertically not horizontally. Once created, immutable images may not be modified. These images are created in the off screen memory area. These could be painted by the application after having created a Graphics object expressly for painting on them. While making games and other graphical applications, both immutable and mutable images are made use of.